Extend the life of Single-Layer™ eyelash extensions! This innovative formula coats and seals the attachment area between the eyelash extension and the natural eyelash, creating a protective barrier against water, humidity, tears, oils, perspiration, makeup, dust, and debris. Style, shape, and hold curl while adding a subtle sheen in just one step. Apply only to dry, freshly cleansed Single-Layer™ eyelash extensions. Do NOT apply to Volumation® eyelash extensions. Do not apply this product 48 hours before or after an eyelash extension application. 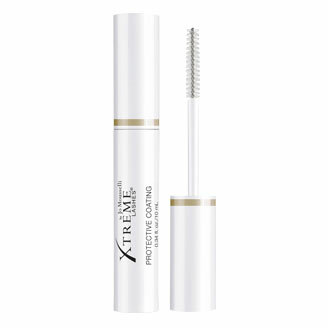 Recommended use of this eyelash extension Protective Coating is 1-2 times per week. Increase application to 3 times per week if you participate in activities that involve excess perspiration, steam, or water. Gently tilt the bottle back and forth 2 times before every use. Remove and replace the mascara-style brush slowly to prevent air bubbles from forming. Hold upright while using to prevent product from spilling. Apply sparingly onto dry, freshly cleansed lashes and avoid direct contact with eyes to prevent potential irritation. Multiple coats over the same area is not necessary. Recommended use is 1-2 times per week. Increase application to 3 times per week if you participate in activities that involve excess perspiration, steam, or water.